Let’s just admit something right here and now. Halloween can be one heck of a stressful holiday! Am I right? From figuring out a quick meal for dinner and getting kids in their costumes, to finding the perfect spot to go trick-or-treating and dealing with the bucket full of candy afterwards – there’s a lot to take in. 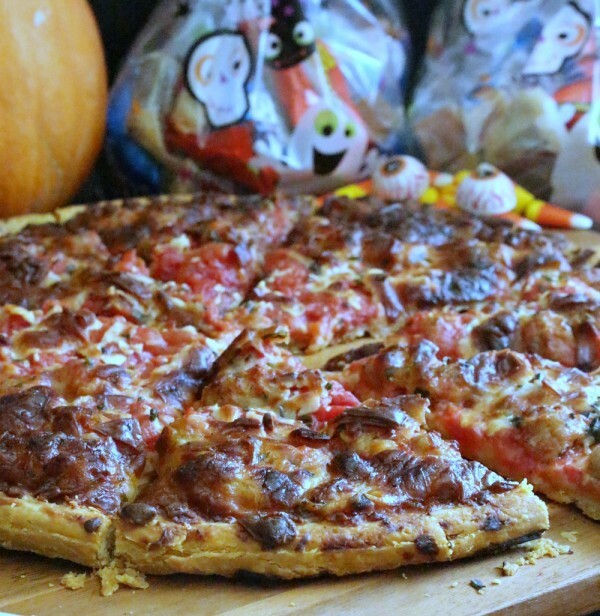 I’ve teamed up with Home Run Inn Pizza to share ways to have a relaxing Halloween night and hopefully help make it a little less stressful, and a lot more fun. As my husband and I have gotten older (and hopefully wiser) we’ve learned to let go of the things that in retrospect, really don’t matter and focus on the ones that do. For example, as our two teenagers have gotten older, Halloween is less about celebrating it together as a family and more about having a fun night with their friends. Instead of taking it personally, we’re thankful they have good friends and relationships they can count on. Besides, we still have maybe one more year where our youngest wants to hang with mom and dad! 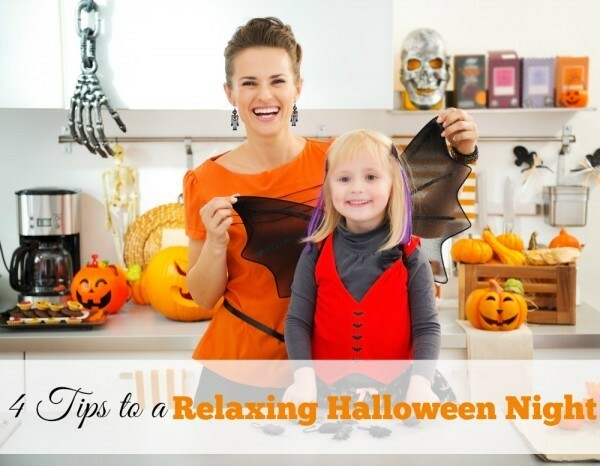 In order to simplify our lives, we’ve implemented a few things over the last few years that have helped make Halloween night an enjoyable, relaxing and fun time. Here’s how. Do one thing for me. Close Pinterest (with all of their handmade Halloween costumes) right now. Done? Good. I’ll never ever forget the year our middle son decided he wanted to be a gummy bear for Halloween. Do you know how many gummy bear costumes there were then? None my friends. Not a one. That night I learned and accepted that my kids will always have store bought costumes. End of story. There’s nothing wrong with a store bought costume. Do what works for you and your family, and tune out all of the other noise of ‘what makes a good mom/dad’. What you are capable of doing is enough. I remember several Halloween nights when I decided that cooking a big meal was necessary. When in reality, all my kids wanted was something tasty and fast, so they could get out the door for trick-or-treating as soon as possible. Instead of cooking, then coming home to clean up afterwards, we’ve opted for something like frozen pizza for dinner. Just pop a Home Run Inn Pizza (or two) in the oven, add a salad and/or fresh fruit and you have a fast, delicious meal to feed your family. 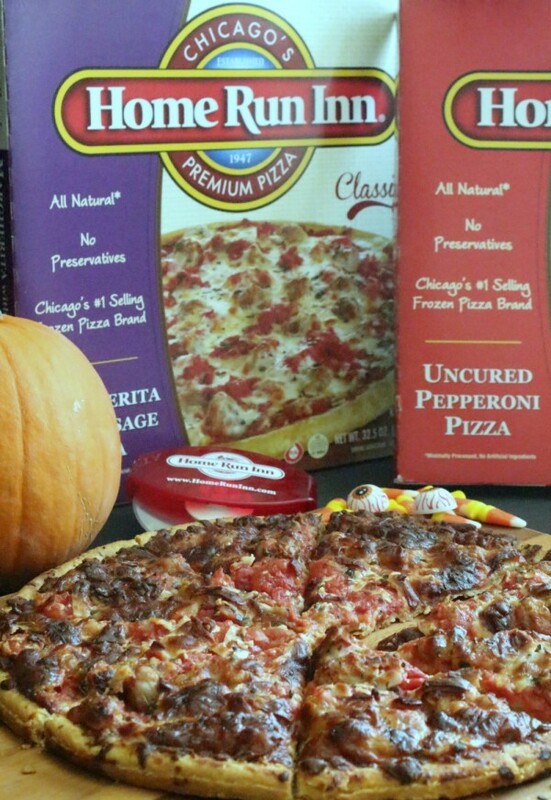 We had the chance to try HRI Pizza, which just so happens to be Chicago’s #1 selling frozen pizza. Now, I’ve been given a little bit of a challenge when it comes to preparing meals for my family. My two sons decided about a month ago to become vegetarians. It was something I thought would last a week and they’re still going strong. Not only that, but my entire family has become much more aware of what we’re putting into our bodies. The fact that HRI Pizza is all natural, contains no preservatives, nitrates or nitrites helps me as a parent feed my family a quick meal I can feel good about. I prepared the cheese pizza for my sons, while the rest of us inhaled their margherita sausage pizza, which is made with all-natural homemade Italian sausage (it’s prepared daily and spiced with their unique old-world family recipe). On a side note, add some Halloween decorations to the table set up for some fun. I added Halloween treat bags, pumpkins, a Boo sign, eye ball erasers and glow-in-the-dark skeleton hand pens. I am so using those pens! 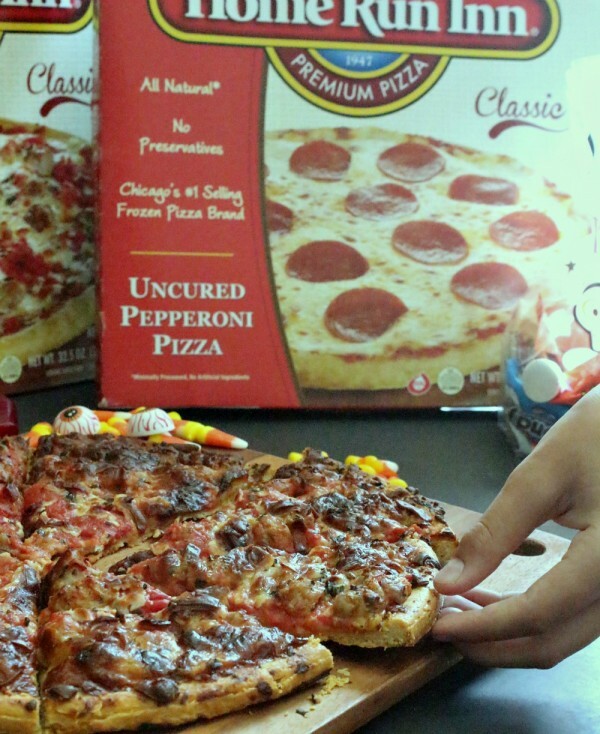 A frozen pizza that tastes amazing and is prepared in a way I can feel good about, equals a happy mom and family. You can learn more about HRI, including where to purchase, here. I’ve been there before…you get home way later than planned. The kids want to go through their Halloween candy, but you just need to get them cleaned up (scrubbing off Halloween makeup most likely) and in bed so the next morning isn’t World War III. If you know you need them in bed by 9, set a reasonable time to be back home so everything that needs to happen before bed, can happen. And remember, the less time you’re gone, the less candy they get. It’s a win-win for mom and dad. Also, let the kids know they can go through their candy after bath time. There’s nothing more stressful at bed time than an all-out meltdown. Try to create a calming environment for the kids as they’re winding down from the night’s excitement. You know your kids best. What calms them? For us, it’s a dim lit room and peaceful music. Not the TV. Light some candles, play some calming music and let the kids go through their loot. 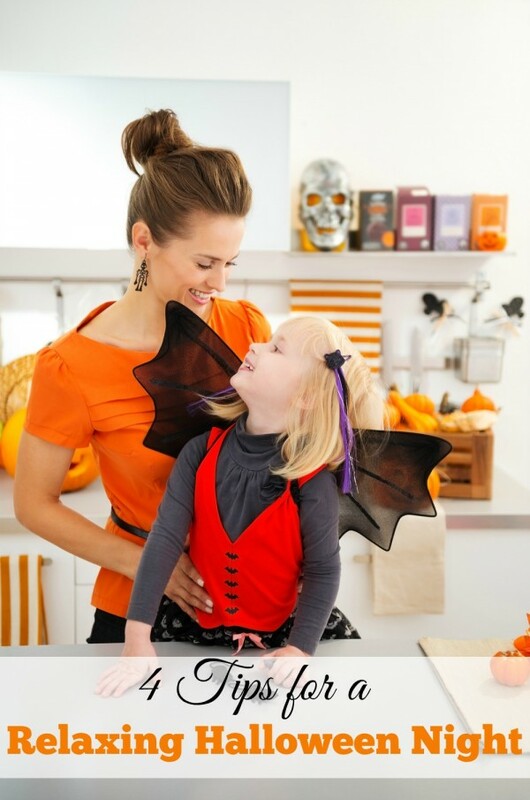 Do you have any special things you do on Halloween to help make it go smoothly? Please share your tips!